Grow your pest control business with geo targeted content and informative pest pages. The only internet marketing company in the world with pest technicians on staff. Reduce call times and convert more calls into continuing customers with engaging content. Reach more buyers with websites that automatically fit any screen. Earn a 5 star rating from popular review sites through your website. It doesn’t matter how good your website looks if customers can’t find it. Search engines like Google, Bing and Yahoo are today’s Yellow Pages. Your pest control company should be accessible, available and responsive - and that starts with being found online. With 75% of search engine traffic visiting the web sites listed on the first page, businesses with poor rankings are unlikely to receive new customers. As the industry leader in pest control SEO for over a decade, our team has the experience necessary selecting the right key words that convert leads to sales in your market area. We'll help you build informative web site content that is both attractive to customers and relevant to search engines. 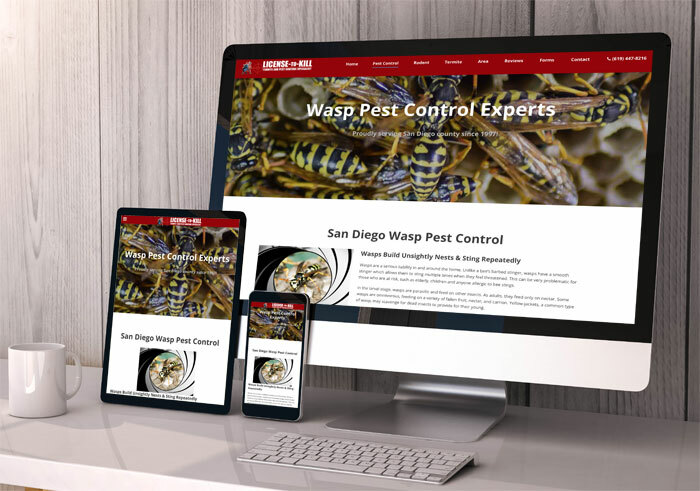 Every member of our SEO staff was a licensed pest control technician and has hands-on field experience, ensuring that your content is expertly written and indexed quickly for maximum result. Establishing your online presence by building your web site according to SEO best practices is the first step. The next step is understanding how visitors are using your website so more visitors convert into customers. We help improve sales conversions by tracking online activity in order to suit your web site to match your business goals. Our SEO packages are designed to provide a reliable internet marketing solution for pest control companies. You'll get the features, stability and structure needed for a strong web presence focused on attracting customers and selling your services. Complete audit of your current web site. Identifying competitor strengths and weaknesses to close the gap. In depth keyword research brings the most traffic to your door. Responsive HTML5 web design that works in every device. Websites free of errors or outdated SEO tactics. Complete web site optimization with proper tagging for each page. Ensuring your site is available to every search engine. Authoritative content that answers questions and shortens call times. A/B content testing improves visitor to lead conversion rates. Monthly reports that help measure SEO results. Review solutions that get your company the 5 stars it deserves. What Types Of Pest Control Companies Do You Work With? Your company's size does not matter to us, we're happy to work with all pest control companies that are looking to improve their market reach and grow their business. That depends on the market area your business is approaching, your company's web site age and the size of your business. Generally, our clients see improvement in their overall search engine rankings within 1-3 months. Too often, pest control SEO is focuses on one keyword - a small slice of a very large pie. According to Google, 15% of all searches are unique and haven't been searched before. Limiting your site to 3, 5 or 10 keywords is the past. We build optimized, informative content throughout the whole site so every page ranks well for your service area. We target hundreds of keywords with your web site, improving market reach. Show Up For Every Pest, In Every City You Service! We don't charge by keyword or by number of pages. We'll optimize your site for every pest, city and county that you service. Expect compelling, informative pest control, termite and wildlife content geared to help streamline the service call process to land customers faster. Our experience with Full Monty Marketing has been excellent. Our website traffic has been increasing every month, since we have started. We are receiving calls from many different areas, which demonstrates to us the success of the SEO marketing program. Full Monty Marketing has been great for us and I would recommend them to everybody. Full Monty has helped us double our business year over year, for the past three years. They have consistently increased traffic to our website and have carefully guided us to maximize this dimension of our business. Full Monty is professional in all our dealings and have dealt with us in a very fair manner with respect to the services rendered and charges for their work. Without their expertise exercised on our behalf, we would never have achieved the growth and success we have had in our business. Every business owner needs to have a strategic partnership with a website and marketing company to help grow their business. I had searched around for years before finding Full Monty Marketing but had little success with other fly-by-night companies. They were honest and up front with me since day one and told me what to expect. My company did not exist 5 years ago and now my website searches have gone through the roof thanks to Full Monty Marketing. I don’t use the term partnership lightly but they send me monthly reports and updates on how we’re doing. They will suggest regular meetings to make sure they are doing what I’ve asked them to. They know more about my industry than many of my competitors! That means a lot. I owe a lot of the growth of my business to Full Monty Marketing! Thank you and your company for being honest and truthful and providing such excellent services and results. The web page you made us is outstanding, you created a perfect website. So many companies claimed to do what you’ve been able to do for us, but they were a waste of our time and money. It sure is a great feeling knowing anybody looking for termite, pest control or fumigation will be easily able to find us on the first page of Google, Yahoo and Bing - instead of 50 to 150 pages back. Thanks to your marketing, we don’t need Yellow Pages or any other ads. We started with Full Monty Marketing a little over a year ago with our Pest Control website. They did an awesome job and always answers any questions we have. Just a few months ago we had Full Monty take over our lawn website and rebuild and optimize because we were so satisfied with the results from our pest control website. Highly recommend! We have over 13 years experience optimizing pest control, wildlife control and termite fumigation companies. Every member of our staff has extensive pest control field experience. We are the only SEO company in the world with previously licensed pest control technicians on staff. We have hands on experience with the bugs you're exterminating, the chemicals you're using - and most importantly, the customers you seek.